Rage Against The Machine rocked crowds at both the Reading and Leeds Festivals over the weekend. At Reading, the band made a dramatic entrance, appearing on stage in Guantanamo Bay prisoner-style clothes, complete with bags on their heads and boiler suits. Even with their vision totally obscured by their headwear, they played a note-for-note rendition of their opening song, Bombtrack. After the song,the lights on stage were darkened and the band reappeared to finish their set in normal clothes, playing favorites like Bullet In The Head, Testify, Killing In The Name and Freedom. Duiring a song break, frontman Zack de la Rocha slammed George Bush and Tony Blair - declaring that both should be tried for war crimes. 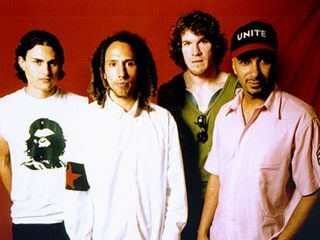 At the next evening's Leeds Festival, Rage Against The Machine stopped abruptly near the end of their fourth number, Bombtrack, and de la Rocha implored the crowd to take a few steps back - a crush had developed and the band were informed by security of a potentially dangerous situation. Rage paused for several minutes while the crowd moved back, then tore right back into Bombtrack. During the band's performance, the massive crowd gasped and cheered Tom Morello's dazzling guitarwork. After the set closer, Killiing In The Name, the group members linked arms, raised fists and left the stage. Mission accomplished.